We are a Partner of North Point Ministries. 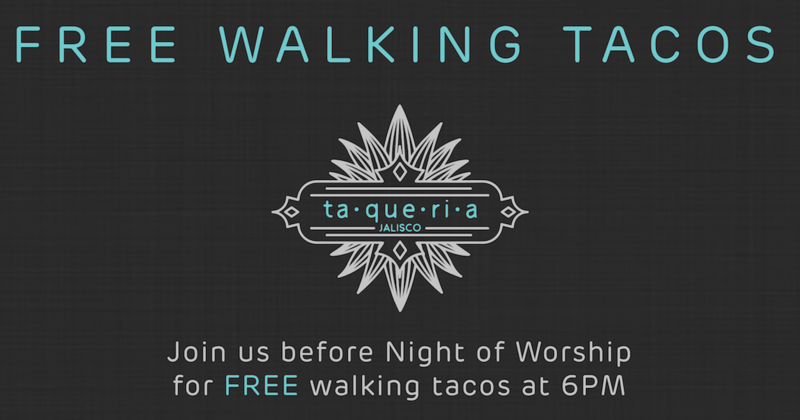 Join us for FREE walking tacos before Night of Worship at 6PM! The walking taco bar will have individual sized bag of chips and once opened, it's the perfect little pouch to fill with meat or guacamole from local Mexican cuisine, Taquerua Jalisco, and all your favorite toppings! Come hang out with your family and friends and then join us for Night of Worship starting at 7PM! RSVP today with the link below!